When you buy and hold a mutual fund in your retirement account, you pay an expense ratio, which is basically a fee to the firm that manages the fund. Expense ratios might range from about 0.15 per cent to well over one per cent, which doesn't seem like a huge difference. However, expense ratios add up over time and this calculator shows you just how much. 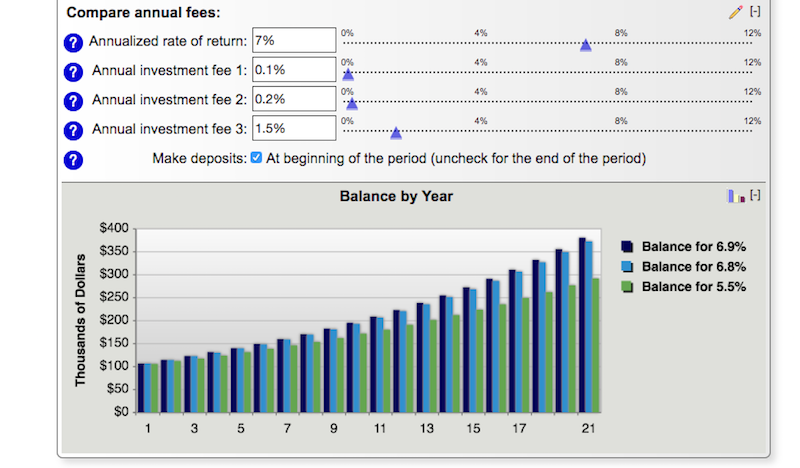 Dinkytown's Investment Fees calculator lets you compare expense ratios for three different funds at a time. You enter your balance, regular savings and fees, and you can see how your balance grows over time, depending on the fee. You can see just how much of a difference even a 0.10 per cent hike can make over the years.